The flags flew, Stars and Bars, in a sloppy parade of pickups thirty strong amid the stop and go rumble of Saturday traffic, past the Bojangles where we sat in an orange booth, eating second-rate chicken. For the past year, we’d held the fried chicken meal we’d eaten at The Clock of Brevard as the gold standard of all those we’d tried since. We’d driven an hour for the stuff, as excited about the sliced beefsteak tomatoes and tart slaw as we were about the dark meat dinner itself, and the GPS dutifully led us, after a full twelve months of anticipation, to what turned out to be a shell of a building, the old Clock sign gone, save for the now-hollow promise of “fried chicken,” the parking lot overgrown and empty. 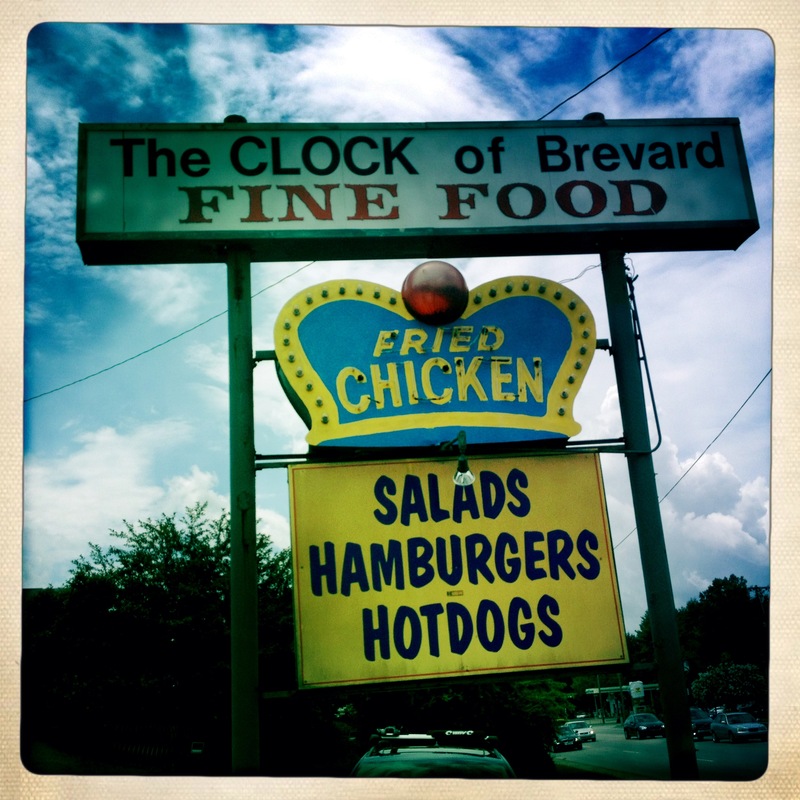 While Brevardians may have been deprived of The Clock—a restaurant once so successful, according to the newspaper, it had run the local KFC out of town—they certainly were not deprived of fried chicken. Next door sat a brand-new Bojangles. Across the street, another chicken chain, Zaxby’s. New buildings, full parking lots, familiar names, familiar food. And, giving in to the annoying default of American life—we were hungry, we were expecting to eat fried chicken, it was right there—we went in, ordered our food, and sat in a booth overlooking the commercial strip mall hub of downtown Brevard. In a booth next to us, two black women in army fatigues—soldiers—ate lunch. Image taken from www. wtsp. com of a similar parade/rally earlier this year. clusters, driving just above the speed limit to keep the flags flying and unmistakable. They flew the Stars and Bars alongside Old Glory, or an occasional coiled “Don’t Tread on Me” snake in a gaudy electric yellow. They’d fashioned flagpoles off the end of their pickup beds, and let their heritage of hatred fly, as they drove down the street in groups of three and four. The soldiers next to us glanced out the window the same time as we did, then immediately turned their attention back to their chicken, as though they never saw it. If they had anything to say about the parade, it was out of our earshot. But we snarled and gnashed and shook our heads, pointing out between bites, as we clutched chicken with greasy fingers, another Dixie truck sailing past, and bitched about redneck assholes. But who are they, exactly? 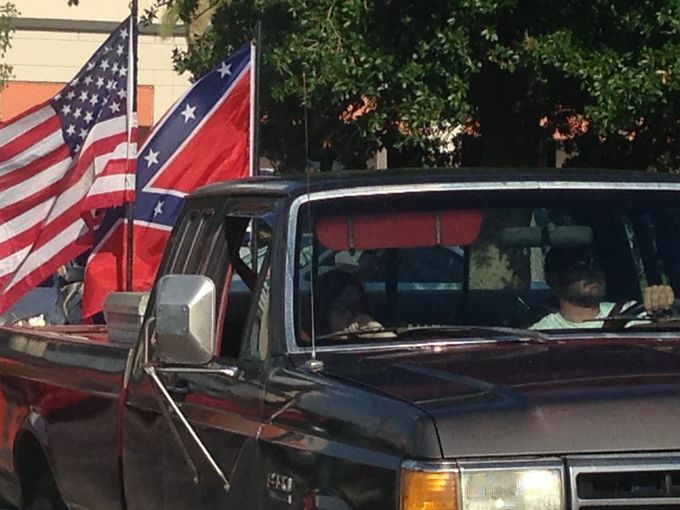 Who was it that decided, on the day after the flag was lowered at the state capital of South Carolina, to organize and hold a truck rally for the confederacy? In the flow of cars moving past our window, how many people supported them? How many reacted with rage, indifference, pride? How can you show it? What would that flag look like? Every time another confederate cluster drove by, I wanted to turn to the soldiers, in a gesture of solidarity and outrage, and let them know that they had allies among them, there in the Bojangles. After all, how many hours had they spent training on their bellies, clutching rifles under barbed wire, standing in formation, shoes shined, saluting the flag, pledging allegiance, preparing for a war that never needed to happen? What kind of sacrifice had they made for themselves, for their families? How did a lack of educational infrastructure make the military seem like a good idea, a viable option in a winnowing field? And with every flag that sails past the Bojangles window, driven by someone in a gas-guzzling rumble of a truck, driven by someone who chooses not to see the undersides of their belief, they disrespect themselves, they disrespect these soldiers, they disrespect everything they think this country stands for. At some point, in another window side booth, two young black teenage boys sat down with their trays, and I glanced at them from time to time as the flag-bearing trucks roared past, anxious and wanting to protect them, curious to see if they’d notice. They seemed more interested in their cell phones and chicken. A few minutes later, a third teenager, a white boy, joined the table and the three of them sat together as teenagers do, swapping jokes, sharing photos and Facebook posts on their cell phones, their attention trained toward each other in natural friendship, laughing over lunch on a Saturday in the summer, not toward the parade of hate looming just outside the window. ← Fruits of my Labor Day Weekend!